MOTHER 3 Handbooks Are Go! I forget the length of the book, it’s somewhere around 240 pages. Those who preordered also got a special dust jacket that was also made to be a really nice poster, and those who preordered early enough also got a very high-quality “Courage Badge” keychain. If you didn’t preorder, don’t fret! They printed a bunch of extras, so you can order one anytime here for $20! 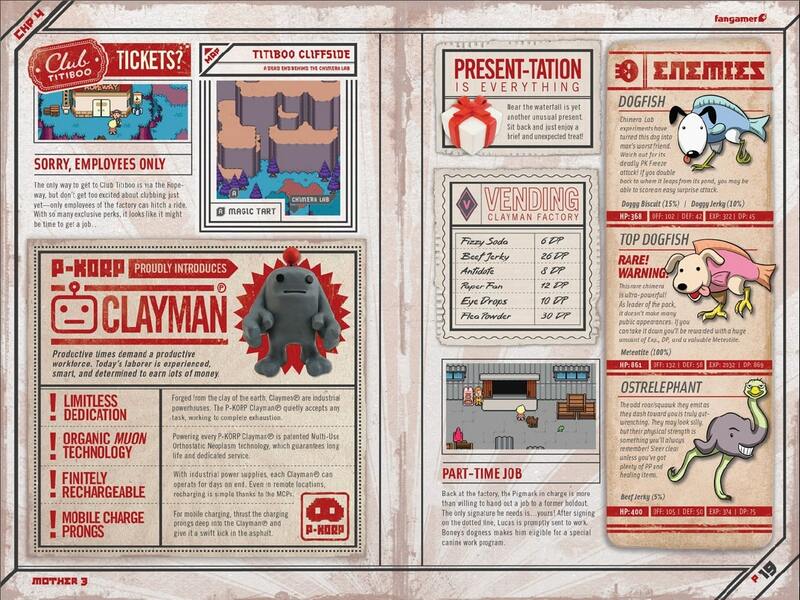 There will also be a lower-res version of the guide online for free. I’ve seen some pics of the online version and it looks nice indeed. Jon and I had first discussed the idea of a guide to complement the MOTHER 3 Fan Translation sometime in 2007. Being a professional designer, he lives for this kind of stuff, and he was very eager to do it. 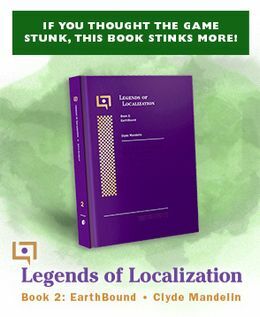 After many weeks of delving into law books and contacting a whole bunch of people, Reid start the guide project started in June 2008, and the hope was that the guide would be ready when the translation patch was released. The patch’s progress kept speeding up, though, and the guide folks couldn’t keep up. Of course, it would’ve been stupid to hold back the patch, so the guide was delayed and the guide people were able to catch their breath and put a lot more awesomeness into the book. The guide was written by just a few people, and edited by Reid so that the writing sounded consistent. Emilio provided probably several hundred really nice illustrations, Sebastian illustrated all 256 or so items, and Camille made clay models of all the game’s bosses and other interesting things. One of the coolest things about the EarthBound guide were the clay model pictures, and her creations for this handbook are just as amazing. The writing process was pretty intense, and in the end, I’d say more than half of everything that was written was cut out, partly because at first it wasn’t clear how the book’s design would be. Plus, 240-ish full-color pages isn’t cheap to print, so double that would probably put the book beyond a reasonable price. 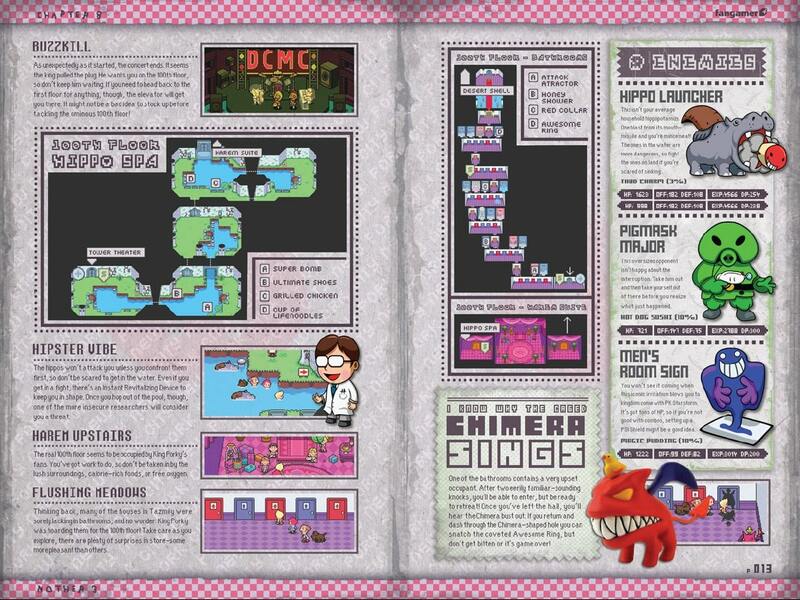 Also, the writers and editors did such a good job that they even found out little tricks and things that I never knew about, and I lived in the game’s code for a year and a half! The guide was sent to the printers a few weeks ago, and what came back was literally 2.5 tons of books. To avoid the crazy shipping costs for that, Reid chose a semi-local printing company (Ben Franklin Press, in Tempe, Arizona) and did several commutes back and forth between Tempe and Tucson in the “EBus”. Also, because packing many thousands of books would cause insanity, a bunch of people flew down to Tucson for a “Packy Party”, which was basically two days of sitting in a hotel conference room, packing stuff, drawing unique little things on each individual packing slip, and other such packy tasks. 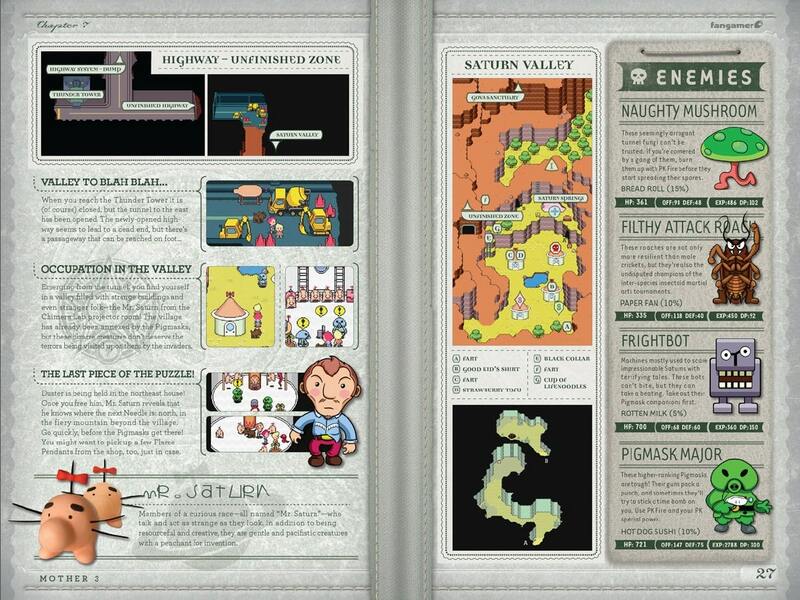 Anyway, that’s the very quick history of the MOTHER 3 Handbook. Rather than continue to babble on, please enjoy the following images! Click the “PicLens” link to see everything in a handy-dandy slideshow format. Oh yeah, apparently Jon spent so much time in his chair while working on the guide for the past few months that the chair is now stained blue from his jeans. Yet, even after that, he and Reid are already talking about doing another guide. These people are clearly insane cultists. 53 Comments to MOTHER 3 Handbooks Are Go! Awesome! If I had the money, I would buy it. All this for $20 is amazing! Can’t wait for it to ship to here in Michigan. I got mine today. First I was like :O then I was like 😀 and then I was like :3. I seriously love the handbook. I put my Courage Badge on my car keys. I live in Tempe. Cool. Mato, you’re seriously in no position to call them cultists >.> you lived in the game’s code for one and a half years, sacrificed much sleep, and you’re doing mother1+2 now (albeit jeffman might be working on the mother 2 part). B oE AN: I don’t know, I know it’s being worked on as we speak though. Probably sometime soon. That slideshow brings back memories. I should’ve pre-ordered the handbook back when it first came out, but I’ll still be checking out the free version online. Great job, guys. Mato so what your saying you can still purchase one?! Because after seeing those two blog entrys about this I’M so insane about these now!!! The content of this guide looks amazing! Great job, to those that worked on it. You just made my upcoming birthday month! I haven’t finished Mother 3 yet so this will be a great experience! I hope its as fun as the Earthbound Guide! I bought one (well asked for it for christmas) because I felt sorry for you guys because of your hard work and I followed you for almost the entire time. I beat the game with every item and every form of every enemy in Japanese, but hope to do so in English one day. I wanted to understand the story of what I beat beyond the actions. 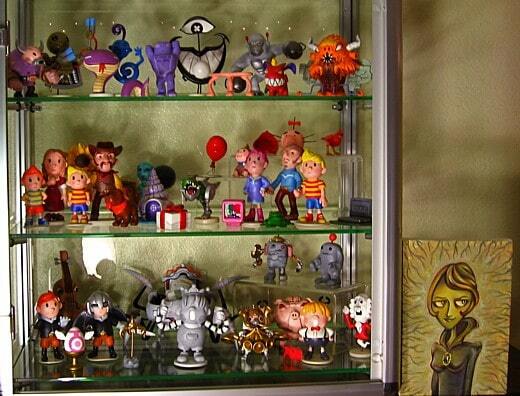 I want those figurines so bad! This looks awesome. I will be ordering it (If I can convince my wife to let me use her checking account). It’s almost funny how talented some of the Mother fans are. Or it would be funny, if it wasn’t sad that the only way for us to play any iteration other then Earthbound involves hacking. 🙁 Thanks for the hard work, you guys deserve a luxury banana or something. can we buy the figurines? Wait, this was 100% fan made? I haven’t been following it much…from what I had seen, I thought it was OFFICIAL and you were just translating it. Slowly. Or something. Oh man, that looks beautiful. I’m so dang tempted to whip out the wallet and start ordering one of these — you guys did a ridiculously great job in making it look official. Those clay models are so freakin’ cool! This is a very well-composed book, very professional. Kudos to all involved. I especially like the keychain, as I have been wanting a nice keychain for years and I now have one. I think it would be appropriate if I gave it to my future child someday. Oh, but back to the book. I adore the page after the final battle. 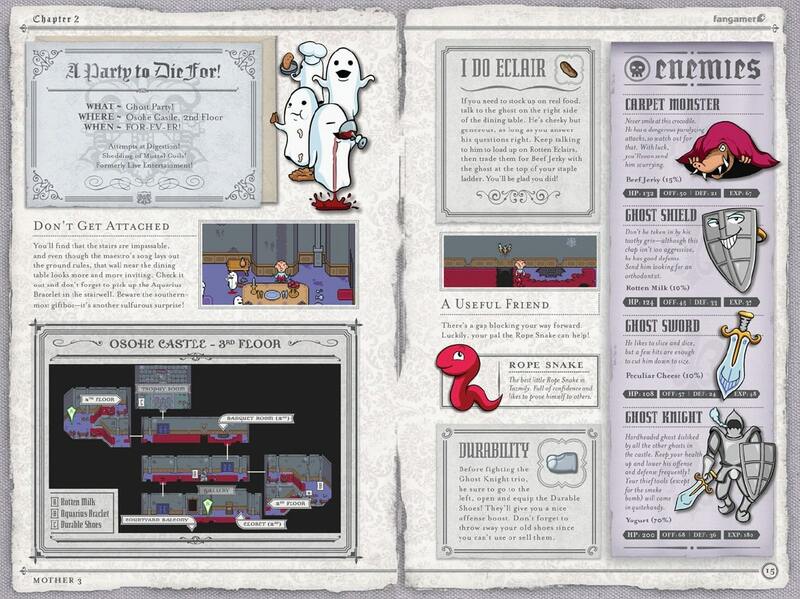 I imagine somebody fallowing this guide when playing the first time through will smile when they get to the end and see a place to…well, everybody can figure it out for themselves, huh? That Porky figure is made of epic win! Hell, they ALL are! I can’t wait to get mine! I hope it comes tomorrow so I can finally stop worrying about getting hit by lightning. And I really hope to see those clay figures end up on ebay. I’d set aside $100 and see how many I could get. Oh my god. That thing is so incredibly beautiful. I’m staggered at the amount of love that has been put into this. The clay figurines look AMAZING. The complete design of the book. Every page has perfect layout, design, and customized stuff like those beautiful pix, the font changes, the fake P-KORP ads. Heck, you even created a custom Copyright sign just for products of P-KORP. I think I’ll buy one. Also, I wish I had the materials and the time (most of all, the talent) to make clay figures such as those. Go Go EBus! Ridin’ thru the land! So the guides got packed in Two—Tucson, and printed at Franklin Ba—Press…? Extremely well done, guys. That looks amazing. It’s just unbelievable. Mother fans really are insane. I got my guide in the mail yesterday! It is so absolutely beautiful and professional looking! I am so happy! It is so much like the first EB guide. I used to read that thing just for the fun on it! This is so exciting! This is AWESOME. And of course, some of the best artists ever got in on it. I’m just blown away. This look like it’d be nice to buy even if I’ve already beaten the game. Spectacular!! Great work Starmen.Net team!! I got mine today! Absolutely amazing! Definitely do another guide! If it’s for Mother 1, Mother 2 / Earthbound, Chrono Trigger or Robotrek I will buy it immediately!! Fangamer has talked of branching out with Chrono Trigger and I think that’s cool, but they really should take a look at Robotrek. Why? Robotrek is a modern, sci-fi RPG kind of like Earthbound and gets no respect! Play it, you might love it! Does anyone know what this ( http://earthboundcentral.com/wp-content/gallery/m3-clay-models/3291143726_c254f6eb60_b.jpg ) is? I’ve played Mother 3, and I’m pretty sure I remember seeing it somewhere, but I can’t remember, and I couldn’t find it when looking through some sprite sheets and the Starmen.net walkthrough. In the video, I can tell it’s from Chapter 7, but not much else. It’s right above the entrance to the Chimera Lab. Ok, I have to admit that “The Duster” jokes still make me laugh. I’m so excited for mine to get here, haha. IT looks amazing, I hope my copy will arrive soon. Just one thing to say, It broke my heart to be unable to help in this awesome project. This sold me on it. I thought it was nice when mentioned before, sure, but wasn’t sure I could spare the money… to heck with it. I’ve ordered one, and now I’m camping outside my mailbox! It’s very nostalgic. I remember, as a kid, enthusiastically reading players guides from end to end, basking in the game and the illustrations and everything I could. Nowadays, who has time for that? …but I’ll be making the time when my Mother 3 guide arrives, oh yes. Speaking of the Ultimate Chimera, the best way to go about it is deposit all your DP and save with the nearby Save Frog. That way, even if the Ultimate Chimera bites you, then you’re fine and don’t lose anything. Plus, if you’re worn out, you’ll be fully healed after Game Over. This looks awesome. Yes, if Nintendo released MOTHER 3 (even if they did it on WiiWare) they would gain a huge profit. They’ll need it, seeing the state of the economy. And aspiring players might be able to save the world. (Including me.) And they would gain an even huger profit if they released a player’s guide with even HALF the awesomeness of this one. It’s just that they are unlikely to do either of these things. Anyway, I hope that my mom will let me get this. Yeah, just check out the site (link is in the main post), pretty sure there’s plenty of stock left. I’m not really involved in any of the Fangamer merchandise stuff though, so I might be wrong. Yeeeesss! 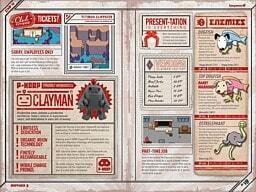 I am so happy fangamer is doing a reprint, I already preordered a hardcover. So looking forward to getting mine finally after all these years!